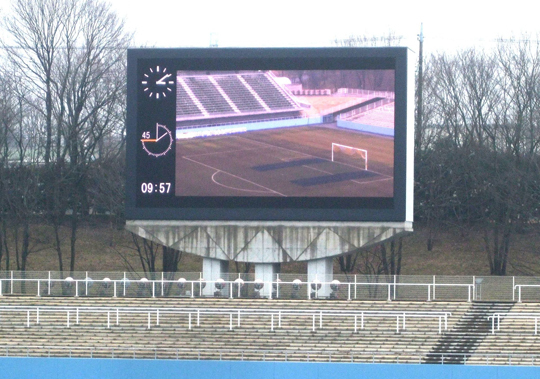 Mitsubishi Electric Corporation (TOKYO: 6503) announced today that it has installed a 665-inch Diamond Vision display at Tochigi Green Stadium, home of Japan’s J League professional soccer team Tochigi SC. The order was received jointly with Tochidenko from Tochigi Prefecture in eastern Japan in August 2011 and installation was completed in February 2012, in time for the team’s season home opener on March 11. The 8.32 m x 14.72 m Diamond Vision display has 832 horizontal scanning lines, the third-highest resolution among all soccer stadiums in Japan. Incorporating the latest light-emitting diode (LED) chips and Mitsubishi Electric’s display control technology, the display is more energy-efficient than its predecessor. Mitsubishi Electric has also installed a 20-meter ribbon board along the field railing. Simultaneous control of the ribbon board and Diamond Vision display enable total coordination of audio-visual renderings in the stadium. The integrated operation console for all signage is highly easy-to-use, allowing operators of non-professional sporting events to use their own roster presentations, connect personal camcorders and more. The new screen is equipped with an emergency backup power generator, allowing the stadium to serve as a disaster evacuation site or for public notification purposes in the case of blackouts. Mitsubishi Electric has installed more than 1,700 Diamond Vision displays globally since erecting the world’s first full-color large display system at Dodger Stadium in Los Angeles in 1980. Going forward, Mitsubishi Electric will continue to expand its business in large displays for public stadia and other sports facilities.